Dazzler. 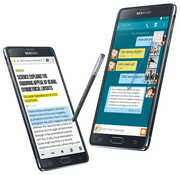 The concept of the Galaxy Note, a high-end smartphone with a digitizer, is still unique and well implemented by Samsung. But the device cannot utilize the promised additional performance of the Snapdragon 805. 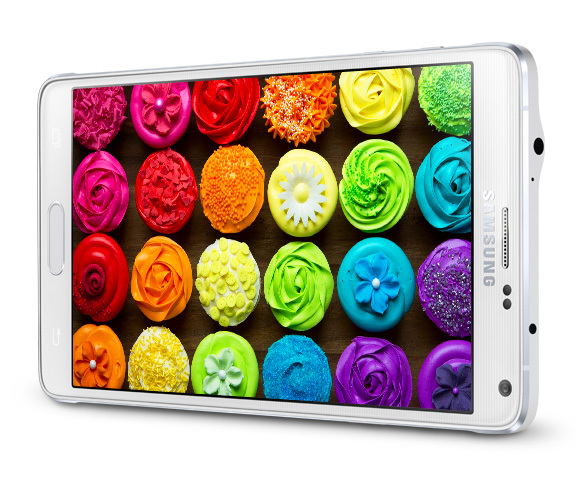 However, the Note 4 probably has the best smartphone display, which shines bright and can also convince outdoors. 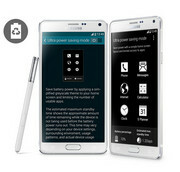 Positive: Slim metal case; excellent super AMOLED screen; powerful processor; excellent battery life. Negative: Poor fingerprint reader; mediocre speakers; expensive. 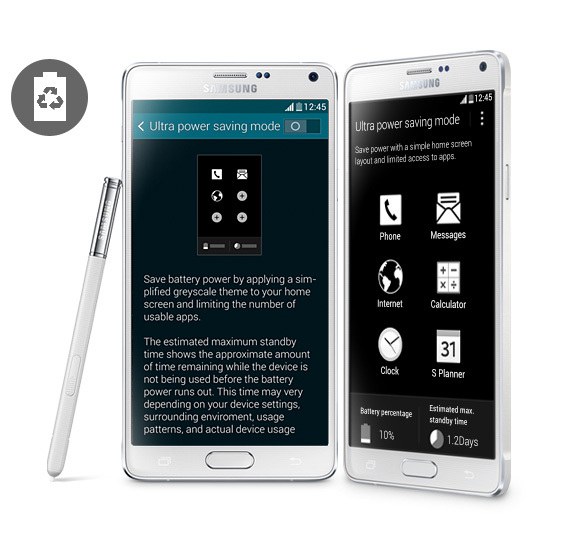 Positive: Super AMOLED screen, sublime and reactive; S-Pen: convenient; efficient and quick essential. Negative: Feeble speaker and poorly located. 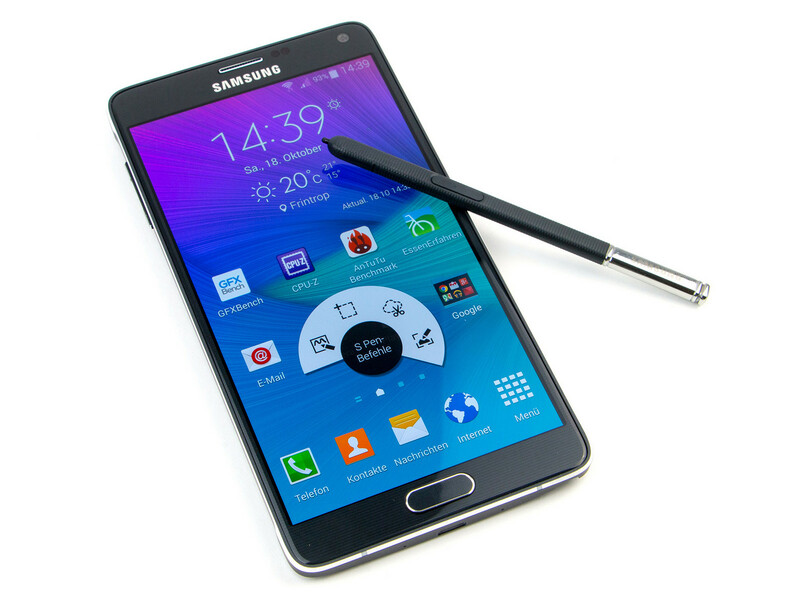 The Samsung Galaxy Note 4 is the latest update to Samsung's Galaxy Note phablet series. After many design adaptations, Samsung finally decided to use premium materials such as a full metal frame while keeping profile sleek and the edges curved elegantly. Only the soft textured back cover is kept for superior grip especially during single handed usage. 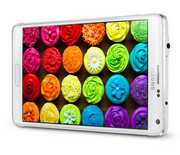 The 5.7 inch Quad HD Super AMOLED display is protected by Corning Gorilla Glass 3 glass for added durability. There are two models of the Android 4.4 KitKat device: the 2.7 GHz quad core processor model and the 1.9 GHz octa core processor model. 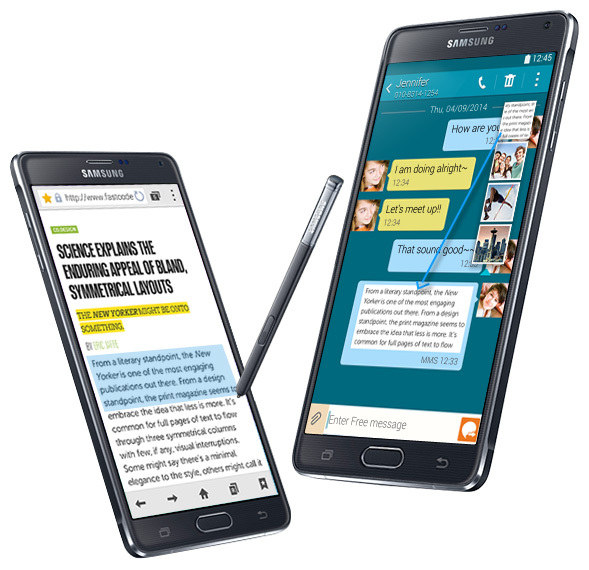 The Samsung Galaxy Note 4 supports 3 GB RAM and an internal storage space of 32 GB. Users can upgrade the memory size with an additional 128 GB using microSD support. Primary camera on the phablet is a 16 MP Smart OIS sensor with Fast AF while the front facing camera is a 3.7 MP sensor rated at f/1.9. Technologies on the device include a fingerprint sensor (PayPal certified), the famous S Pen stylus, which has also been upgraded, Bluetooth 4.1, NFC, and even a heart rate sensor. Battery life is good with a lithium ion cell rated at 3220 mAh powering the system. The entire package weighs in at just 176 g.
91.51%: There do not exist many models, which are rated better. The most ratings get ratings, which are a bit worse.